The EBB & FLOW Arena technology for horse riding arenas have been used in Europe for many years now. EBB & FLOW arena design is widely used for competition arenas. It basically works with a system of drainpipes which are installed under the sand cover. The water is kept in the arena with the installation of a liner which has been laid before the sand is installed. The sump / balance tank next to the arena is where the water level can be adjusted to provide an even moisture level over arena. This level can be set and does not have to be altered unless the requirements change. Altering the water level in the arena is easy and there a no tools required. EBB & FLOW technology provides substantial advantages and is an economical as well as a cost saving design for all levels of the equestrian sports. The costs to install the EBB & FLOW system are less than the conventional arena design and the advantages are obvious. SOILTEX being blended into the most recent EBB & FLOW arena. Installed in Moss Vale in the Southern Highlands (NSW). 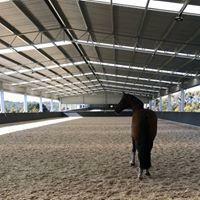 20 x 60m Indoor Arena using EBB & FLOW Arena Kit. SOILTEX being blended into another recent EBB & FLOW arena. 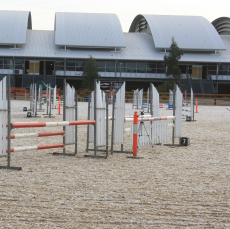 Main arena at AELEC in Tamworth (NSW). 100 x 100m Outdoor Arena using EBB & FLOW Arena Kit. 30 x 70m SOILTEX and EBB & FLOW Grand Prix Arena. Willinga Park in Bawley Point on the South Coast (NSW).